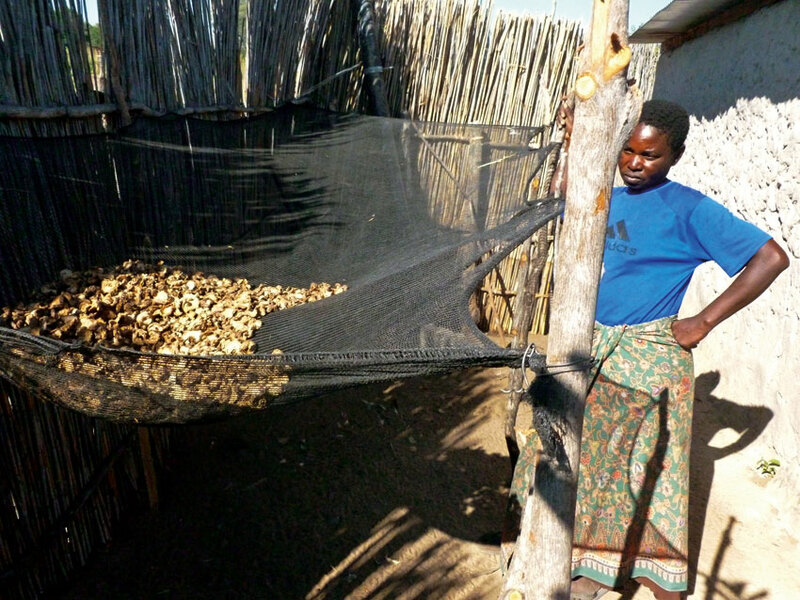 Due to its livelihood importance to rural Namibians, there is abundant research and data on devil’s-claw income generation, value-addition, market access, participation, and resource sustainability, amongst other things. Yet to my knowledge there has been little work on the practical lived reality and embodied experience of digging for this medicinal plant. 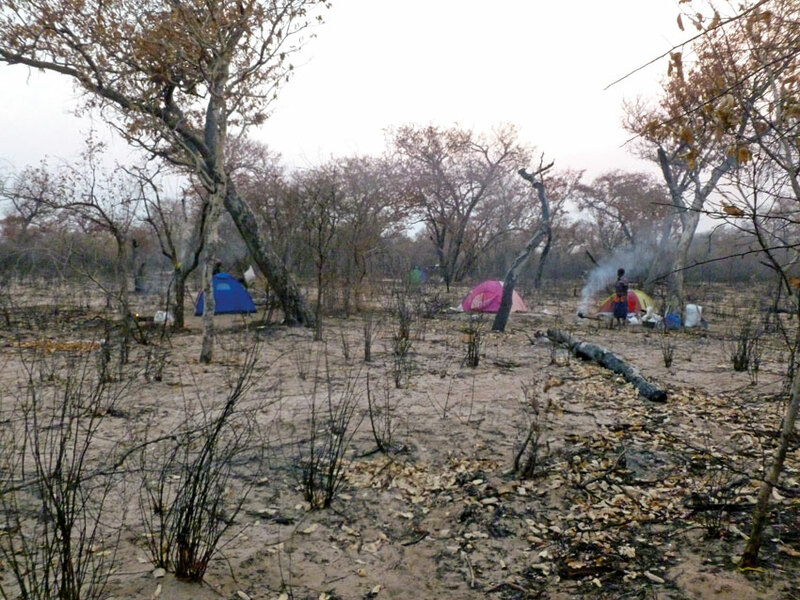 For that reason, at six on a crisp July morning in the Kwandu Conservancy, Zambezi Region, carrying a tent and enough food for a day or two, I set off with Vincent Kakuwe, Senior Ranger of the Kwandu Conservancy, for the forest – to go and ‘get involved’, as it were, and document ‘A day in the life of the devil’s-claw harvester’. 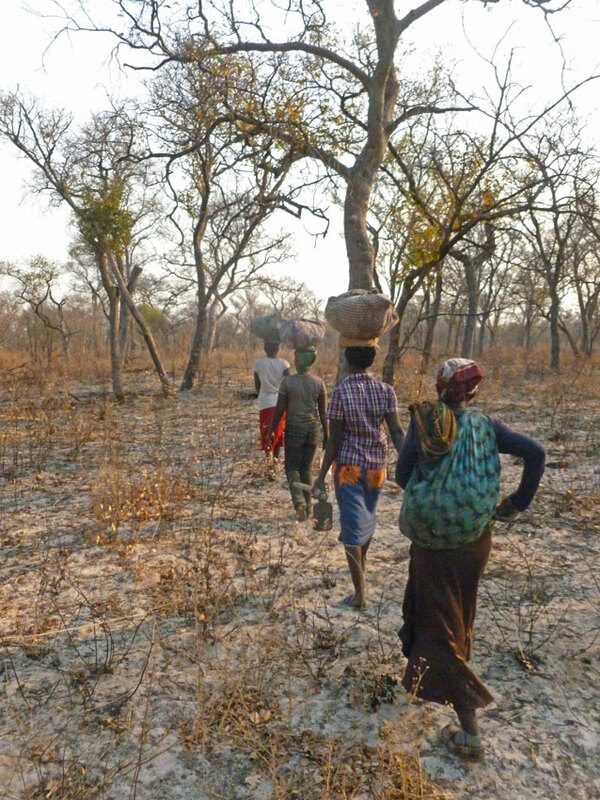 This wasn’t the first time I’d been on a long trek through the bush, yet I never cease to be surprised by the apparent ease with which local people navigate the forest – negotiating the myriad narrow sandy paths that twist and turn around and between infinite trees with ease. “Now you can see the path is just one, because those branches you saw before were just ways to go and collect the firewood,” Vincent told me. “This path is just to go and dig for devil’s claw.” The explanation was lost on me, but he seemed sure we were on the right track to find some devil’s-claw harvesters, and for that alone I was thankful. After two and a half hours of walking, we suddenly came across several Chinese tents – splashes of bright pinks and oranges dotted throughout the otherwise featureless yellow surrounds. We had reached the harvester’s base camp. A bag containing maize meal and a couple of pans further indicated the presence of people, but right now the place was lifeless. We had no time to dwell, however, and after quickly pitching my tent and leaving behind our excess baggage, we continued further into the forest. Harvesters en-route to their harvesting spots. We spent another hour snaking our way through the teak trees before reaching a group of four women, each immersed in the earth to varying degrees. 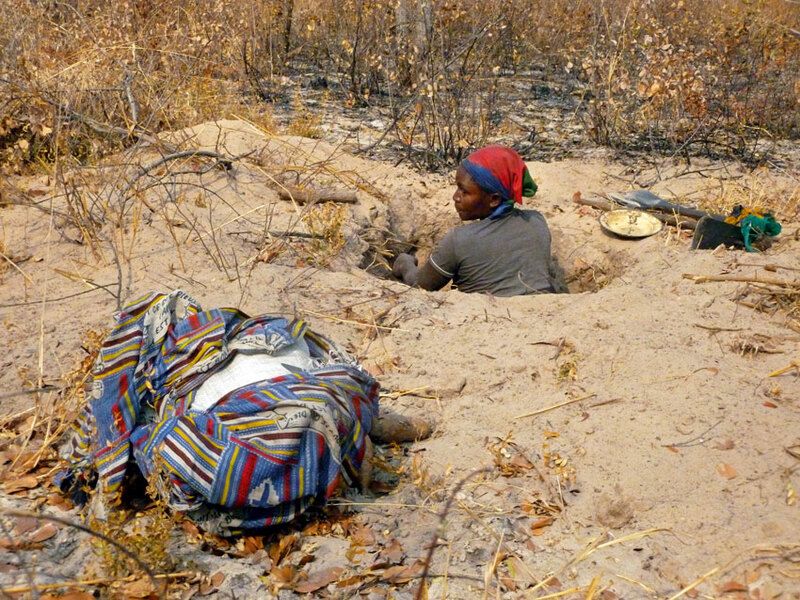 Women always harvest in groups, or ‘gangs’ (as those in the business often refer to them) in order to provide a degree of protection against wild animals when walking in the bush. The women – Precious (Vincent’s wife), Jennifer, Petra, and one other who did not wish to reveal her name – were amused to see a white man in this part of the forest, but were sceptical as to my motives. Thankfully, after explaining I was simply a researcher who wished to learn about the daily experiences of harvesters, they seemed appeased. It would have been disheartening, to say the least, if they had told me to turn around and go back to whence I came. And so I spent the day following and watching the harvesters, learning about the daily process – the initial scoping and searching the ground for signs of the plant; the careful digging around the mother root and tracing of the side tubers; the deeper excavation rendering the harvester a bobbing head above the dusty surface; the collation of tubers; and then covering the hole – before beginning the process all over again. It’s fair to say the pace of the harvesting relented as the day wore on, and at around four in the afternoon the women put down their spades. 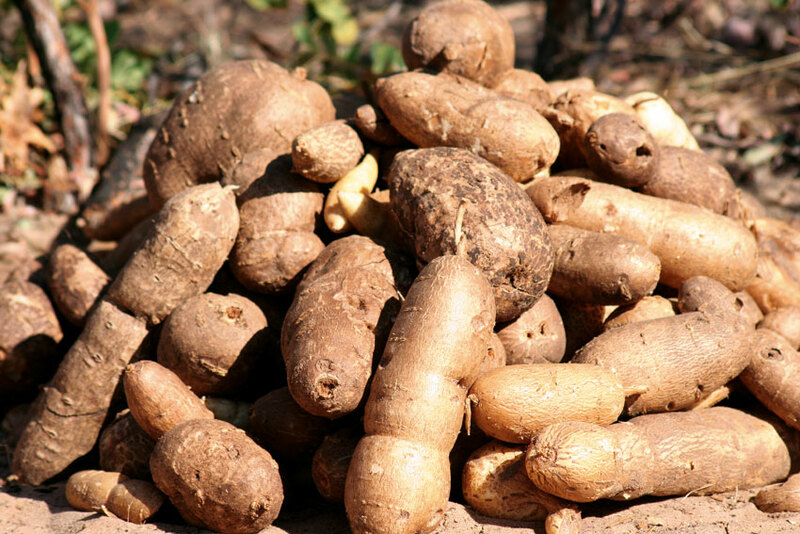 The four of them proceeded to slice their tubers before placing them in their individual bags, singing as they worked. By now the light was fading fast, and after saying farewell to Vincent, who returned to the village, we set off for base camp in single file, the women in front carrying the fruits of their day’s labour above their heads, effortlessly, as the sun set behind them. 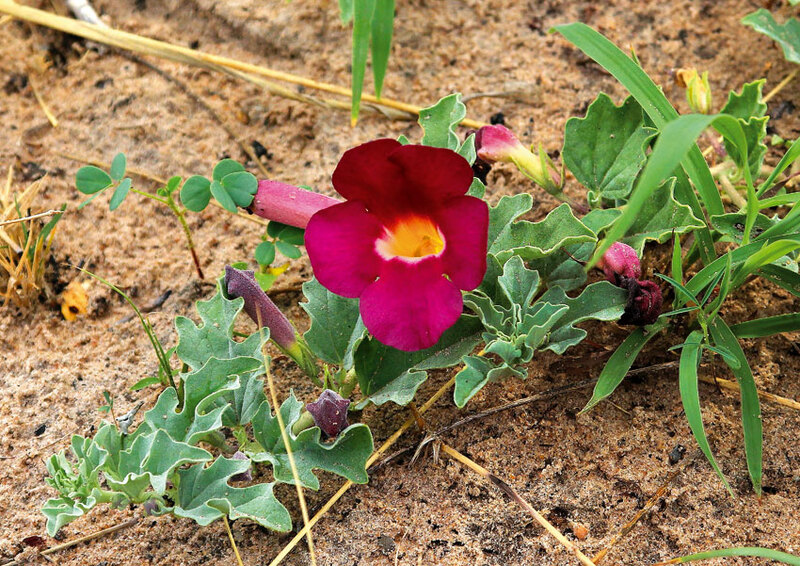 Devil’s Claw plant and Flower. Photo ©Dave Cole. Devil’s claw tubers. Photo © Dave Cole. Foolishly, I’d taken only one litre of water with me, which was gone by mid-afternoon. By the time we’d completed the few kilometres back to camp, I was experiencing a thirst the likes of which I can only compare to a time when as a child I quenched it at the kitchen sink, having played football all day. I opened my tent and grabbed a tangerine – which seemed to take an age to peel – and devoured it. Soon after, realising the outsider had come woefully underprepared on the fluid front, Jennifer presented me with a two-litre bottle of water from their reserves. After a tin of tent-temperature baked beans and some traditional bread, I settled down to rest. All the while I could hear the women, huddled around fires, enjoying their pap, discussing the ‘malamatwa’ (the local name for devil’s claw). I fell asleep thinking that no matter where you were in the world, or what your job might be, people tend to take their work home with them. “Not a chance,” I thought, but by the time I had put my boots on and closed the tent, they were out of sight. I ran in the general direction they had taken, following their tracks and listening intently for the far-off sound of female chatter. Before long I had caught up with them, keeping close behind from then on. An hour later we reached the site, and the women collected their harvesting equipment – spades, grubbing sticks and plates – which had been stored overnight in a ditch. They didn’t waste any time getting to work, and I found myself tagging along with Jennifer as the group members dispersed in search of their own bounty. “Yesterday I didn’t get the big one – today I’m sure I’ll get it,” said Jennifer, as she began to dig in the earth expectantly. After an hour or so spent scooping sand from a hole as deep as she was high, Jennifer had harvested a substantial amount, which she was clearly happy with, albeit somewhat fatigued. “I’m tired, like a dog,” she proclaimed. I helped her cover the hole, so as to let the plant re-grow, and we walked twenty yards before she found another plant. Granted, this one was not quite as yielding. Some forty minutes later she was working on another site ten yards away. Around ten-thirty Jennifer was moving on to her fourth site, still without a drink or a pause for breath. The pace was relentless. The other harvesters were far away by now, and for the first time I got the sense that Jennifer was in this alone. There was no camaraderie or singing now. This was one woman giving her all to get what she could from the land. I could hear the faint sound of spade hitting earth from about 200 yards away, but apart from that the eerie silence of the forest was broken only by the sound made when one woman harvests: earth and roots being struck, sand being shovelled or poked, and heavy breathing. Drying on custom made drying ‘racks’. Photo ©Dave Cole. The odd bird would sing from afar, making me wonder what kind of ecological niche could exist to warrant a creature of freedom making this place its home. But even that little bird’s chorus could not detract from the feeling of isolation I experienced standing in the forest next to Jennifer. Like the other women, she had spent the last two months doing this, from daybreak to sunset, typically going to the forest on a Sunday and returning to the village on Friday evening in time for Saturday church. Around midday, perhaps refreshed after her first swig of mahuwa (a milky maize drink), Jennifer said we should go and find the others. I carried her spade, wanting to feel useful. “Sit there, I want to walk,” she said, as we approached Petra. This was not the kind of woman to argue with, so I slunk beneath a tree, seeking respite from the baking sun. I was starting to realise why this kind of research hadn’t been done before. Then I noticed a man harvesting a few hundred yards away, so I went over to investigate. “Ah, so you are seeing how we are suffering here in Africa?” were the words with which he greeted me. His name was Masule, a man currently working in Windhoek, and spending his holiday in the forest with his wife, harvesting devil’s claw. After a couple of hours harvesting, I walked with Masule and his wife to a clearing in the bush where they would slice their tubers, using a couple of dead logs as chopping boards. Knowing I had a knife in my bag, I sensed this was an opportunity to be of real use. I sat alongside them and put my pretty ineffective knife to work on the smaller tubers. “Even though you are only a student, you are cutting like an African,” said Masule, suitably impressed. After spending the last two days feeling pretty useless as I watched people digging holes in a way that to me seemed completely at random, it was nice to feel I was contributing. “It’s just like chopping carrots,” I said. By the time we set off back to camp, the skin was peeling from my hand. But I couldn’t complain. Unlike Masule and his wife, I wasn’t going to be lugging 25 kg of devil’s claw through the bush for the next three hours. Upon reaching the camp, they laid out the day’s harvest to dry, filling their bags with those tubers they’d collected yesterday. 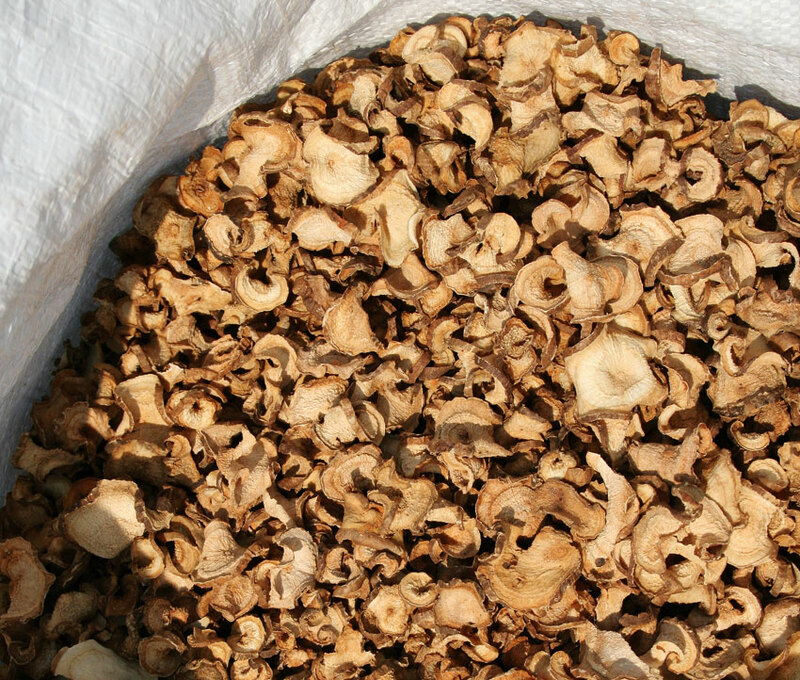 It is a rotational system, allowing the tubers to dry off a bit, in turn becoming lighter, before they carry them all the way back home. As we made our way back to the village, I asked Masule why he didn’t just camp at the field for the week, like the female harvester gang I’d spent time with. “The problem is that we are having a small kid, just in grade 5,” he told me. “He cannot stay in the courtyard once the sun goes down – he will just be waiting at the door, looking for us.” It was a telling insight into the extra burden faced by harvesters who have family commitments back at the village, some three hours’ walk from their place of work. 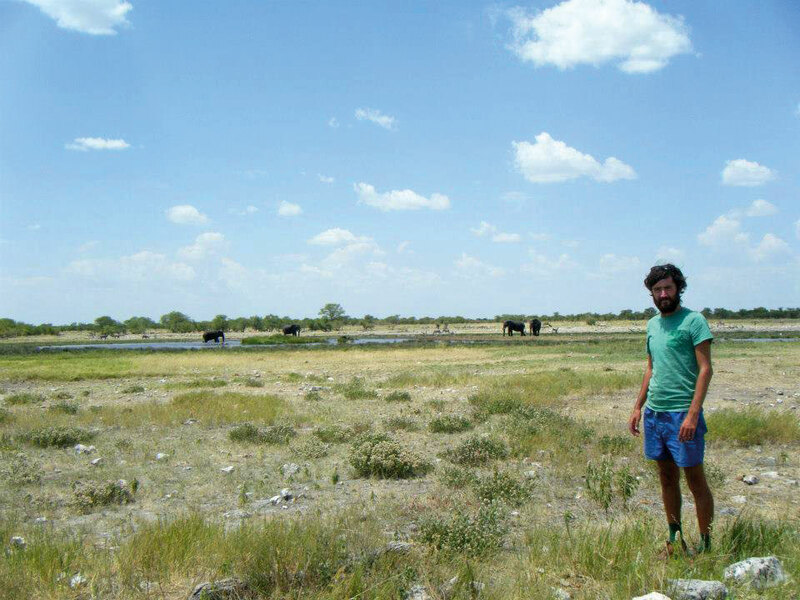 The author and researcher, Lee Hewitson at Etosha National Park. The village I returned to seemed a great deal more metropolitan than the one I’d left only the previous morning. I felt as though I’d been away for a week. Nevertheless, the time I had spent at the coal face of devil’s-claw harvesting, so to speak, had given me a valuable insight into the daily practices and lived experience of those who dig for one of Namibia’s most valuable plant resources – devil’s claw. 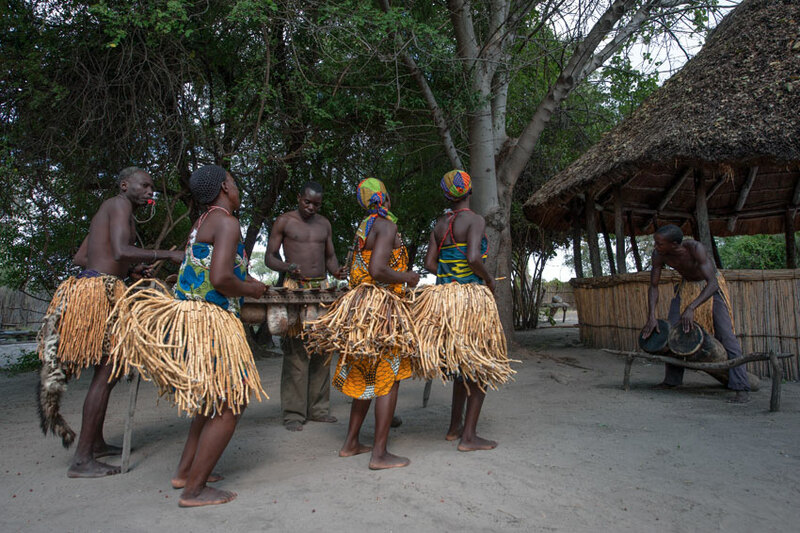 Traditional dancing of the Mafwe. 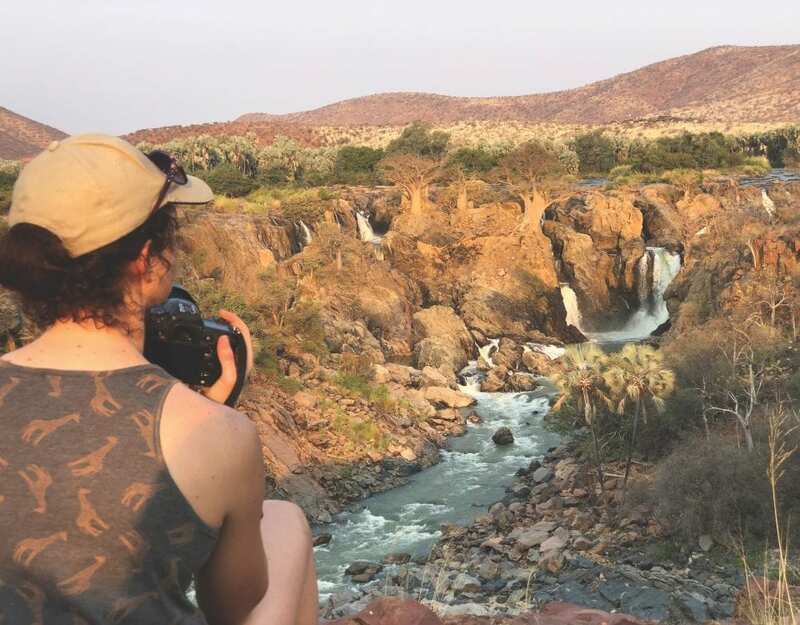 Spot a diverse range of Zambezi fauna including lion, buffalo and kudu on a game drive through the Bwabwata, Mudumu and Nkasa Rupara national parks. Visit the open-air Mafwe Living Museum in the Kwandu Conservancy for a taste of the traditional culture of the Mafwe people. Brave the Elephant Run by embarking on a 4×4 drive to the Nambwa Campsite (operated by the Mayuni Conservancy) and view the Horseshoe Lagoon. 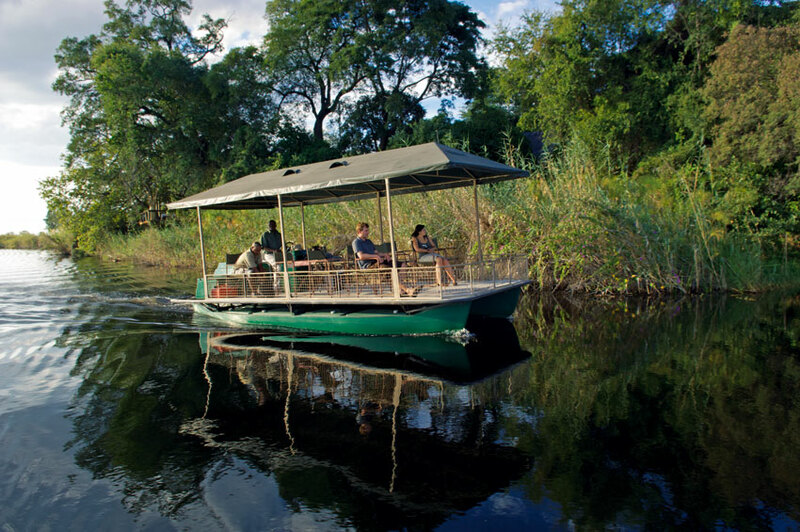 Cycle along the D3502 through the Kwandu Conservancy, passing the local villages before reaching the river. If you have any bike issues, stop off at the Singalamwe Shine Bicycle Shop for repairs. 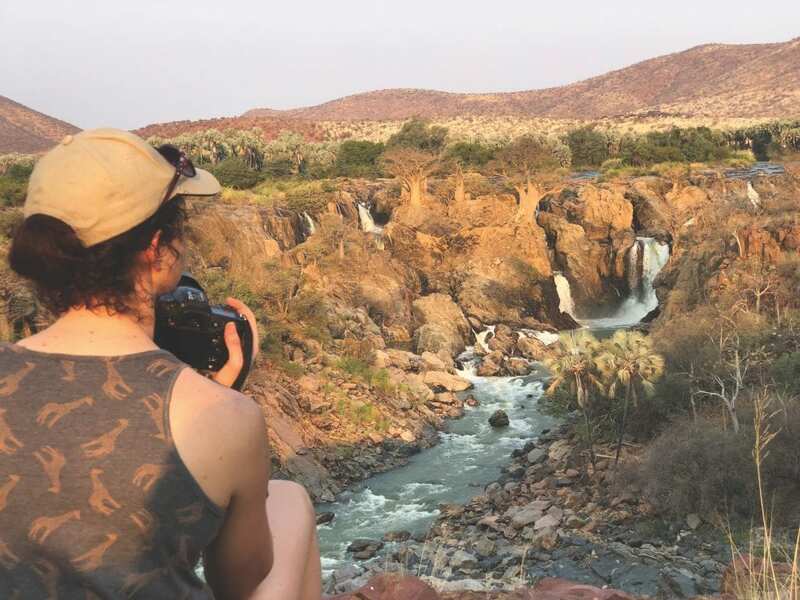 Have a wander around the Wilde Eend Nursery in Klein Windhoek and enjoy a bite to eat at the on-site café where you can sample delicious bread baked on the premises. Walk off last night’s kudu steak surrounded by a diverse range of local birdlife while taking a stroll around Avis Dam on the eastern outskirts of Windhoek. Dine at Garnish, Windhoek’s newest (and only) Indian restaurant, in Trift Street, Central Windhoek. 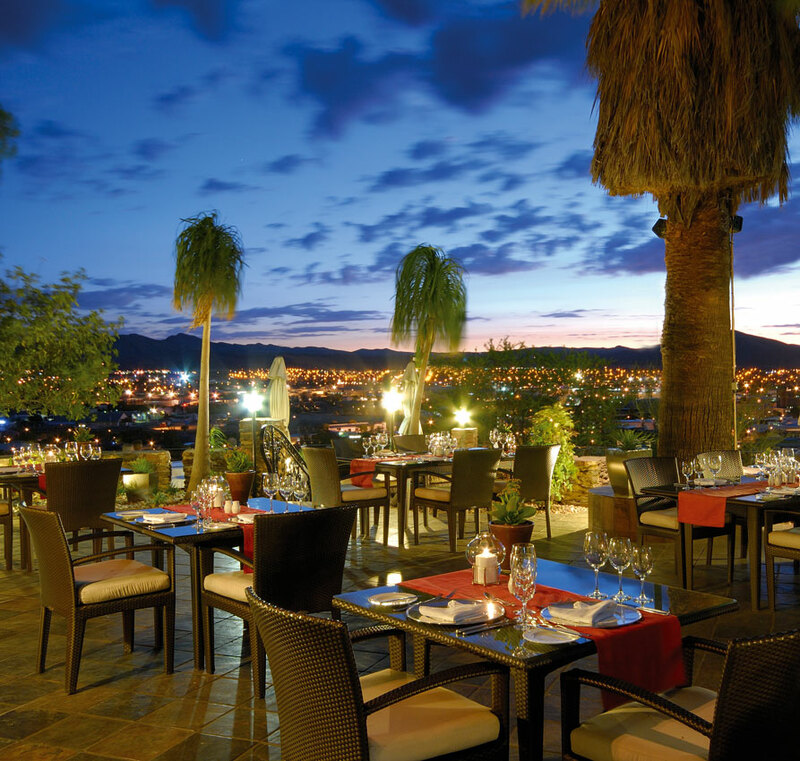 Relax with a sundowner at Heinitzburg Hotel on the top of a hill while enjoying panoramic views over the city.